NETWORK FINALS: The 8PM, 8:30PM and 9:30PM WHOSE LINE IS IT ANYWAY reruns each lost 0.1 in final numbers after adjustment for local baseball preemptions. CABLE HIGHLIGHTS: Even SHARK WEEK couldn’t dislodge VH1 and USA from the top of Monday cable. VH1’s LOVE & HIP-HOP ticked up to 1.38, and BLACK INK CREW rose 0.07 to 1.18. USA’s WWE telecast was at 1.14/1.11/1.11, down from last week’s 1.34/1.25/1.25. But Discovery’s SHARK WEEK owned most of the next slots, with SHARKS AMONG US at 0.96, JAWS OF THE DEEP at 0.92, SHALLOW WATER INVASION at 0.88, and SHARK AFTER DARK at 0.60. 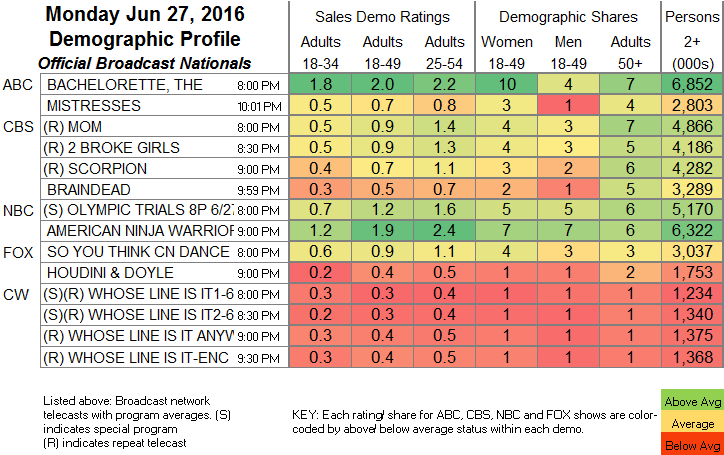 TNT’s RIZZOLI & ISLES gained 0.07 to 0.62, and MAJOR CRIMES was up 0.06 to 0.52. On TBS, AMERICAN DAD climbed 0.06 to 0.54, ANGIE TRIBECA slipped 0.02 to 0.25, and FULL FRONTAL held at 0.27. Bravo’s REAL HOUSEWIVES OF ORANGE COUNTY lost 0.09 to 0.57, SOUTHERN CHARM was down 0.02 to 0.43, and ODD MOM OUT dropped 0.06 to 0.17. Another MTV TEEN MOM “special” was down 0.16 from last week’s to 0.47, but ARE YOU THE ONE rose 0.13 to 0.43. On Food Network, the finale of KIDS BBQ CHAMPIONSHIP jumped 0.11 to 0.38, and CAKE WARS was up 0.06 to 0.36. On Freeform, THE FOSTERS gained 0.08 from last week’s season premiere to 0.47, GUILT rose 0.02 to 0.14, and the finale of MONICA THE MEDIUM dropped 0.03 to 0.08. 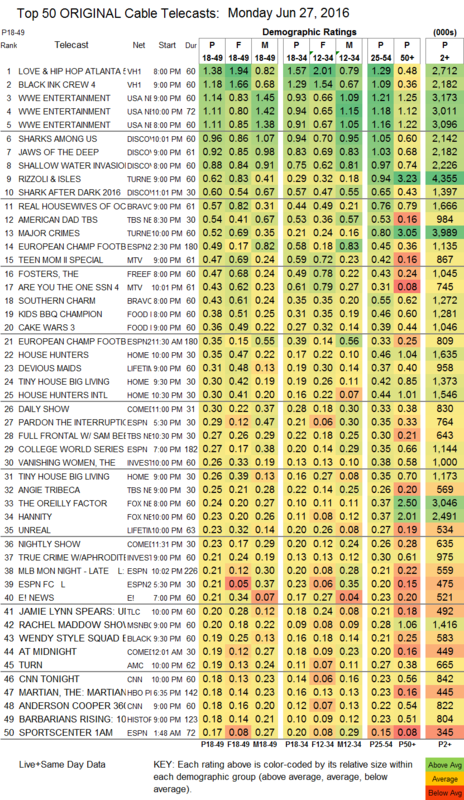 On HGTV, HOUSE HUNTERS ticked up to 0.35, HOUSE HUNTERS INTL was at 0.30, and TINY HOUSE, BIG LIVING was at 0.30/0.26 compared to last week’s 0.31/0.30. Lifetime’s DEVIOUS MAIDS gained 0.05 to 0.31, and UNREAL was up 0.02 to 0.23. The season finale of AMC’s TURN added 0.02 to 0.19. History’s BARBARIANS RISING fell 0.03 to 0.18. On Syfy, 12 MONKEYS rose 0.13 to 0.14, and HUNTERS dropped a tick to 0.06. HBO ran the season finale episode of its mostly online series AFTER THR THRONES at 12:20AM and scored a fair 0.13.